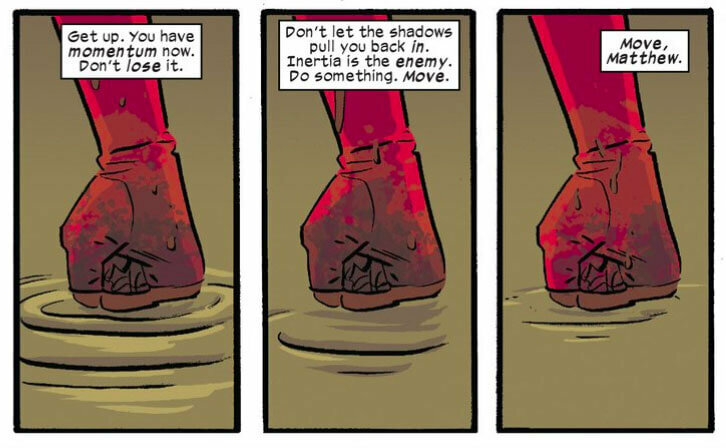 As I mentioned in my review of last issue, there was so much to love about Daredevil #10 that I might feel compelled to return to it in a separate post. Well, that time is now! 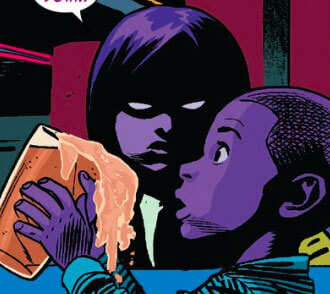 Before we dive in, however, I just wanted to let you know that Comic Book Resources has a Daredevil interview with Mark Waid, from earlier in the week, which also features some amazing unlettered preview art from Daredevil #10. Okay, let’s get to it! 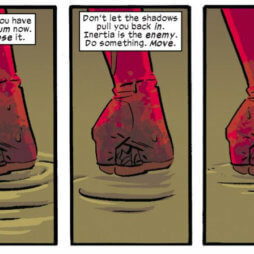 Isn’t it amazing what a strong message a simple series of all-black panels can send? 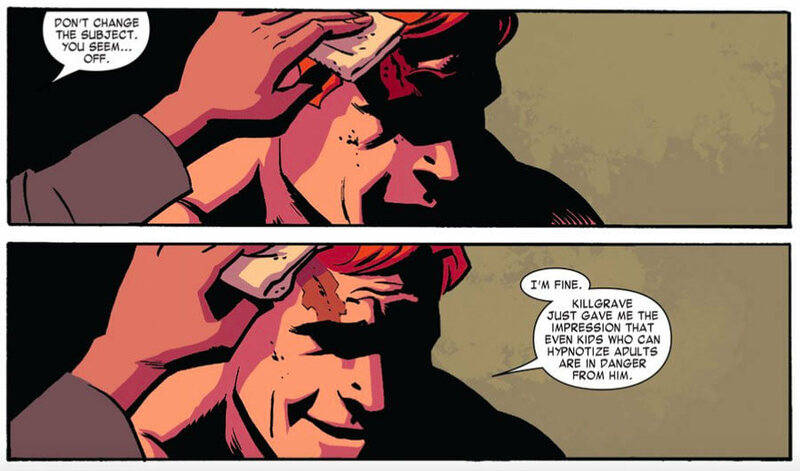 At the bottom of the page, we finally see Daredevil as a tiny speck of red. 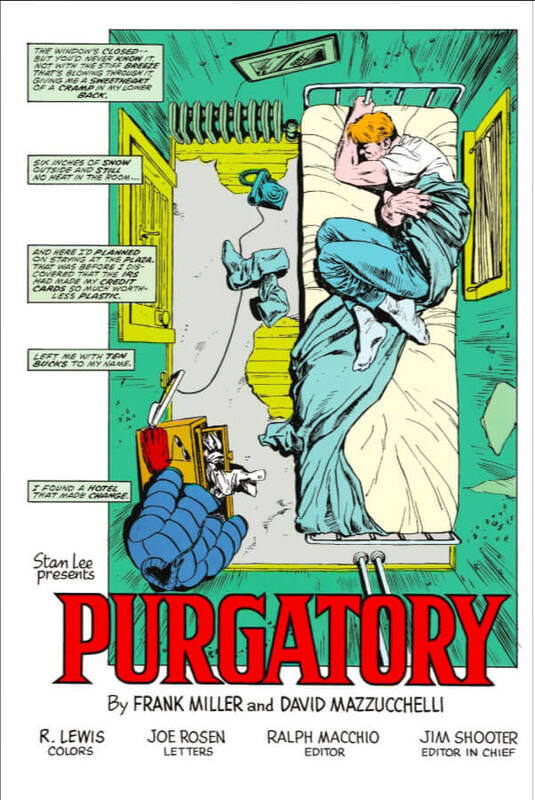 He’s in a fetal and grasping his torso, much like the pose we remember from the second issue of Born Again (Daredevil #228, by Frank Miller and David Mazzucchelli). What makes this image even more striking though, is the absence of a background. He’s not resting on anything, not leaning against anything, not tethered to anything. 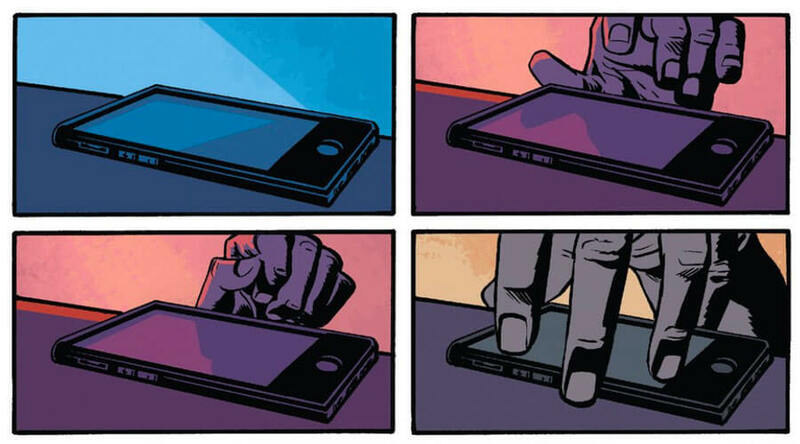 For a character whose world is always black, this page takes the absence of light to whole new levels. He may be smiling, but is he “smizing”? I mentioned this scene in my original review (and yes, I did just quote Tyra Banks), but wanted to mention it here too, complete with the actual panels. These two panels, and the timing of them, perfectly show the hesitation of Matt’s smile (evident by the delay), and the way his head is facing to the side in the top panel. His eyes are hidden from view, so we can’t tell whether he’s “smizing” or not (that’s Tyra-speak for smiling with your eyes, ahem), but that’s presumably a ‘no’. This is true of much of the rest of the scene as well. 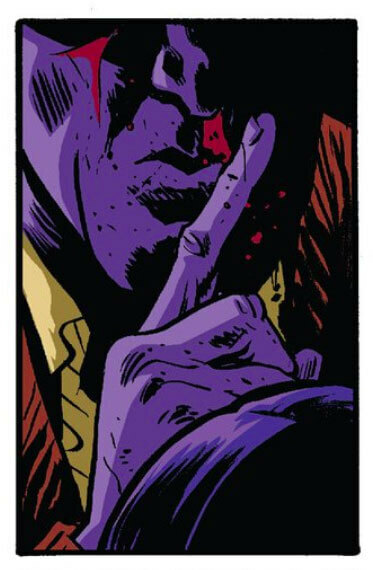 Of course, Matt can get away with not looking people in the eye, but his behavior throughout this scene speaks to his vulnerability and unwillingness to show it. Great work by the whole creative team on this scene. I’m sure I’m not the only one who loved the entire last page. 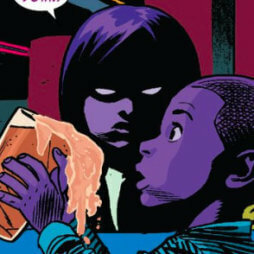 These panels below are a great example of what can be done in comics that simply doesn’t work as well in other mediums. Without a single word of script, Matt’s hand moving to pick up his phone, and hesitating, communicates all that is needed. The passage of time is conveyed by the change of colors as dawn breaks. It’s just really smart and concise storytelling. 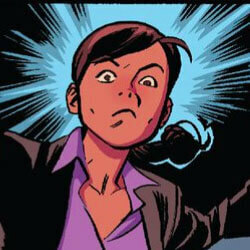 Chris Samnee is truly spectacular at facial expressions. 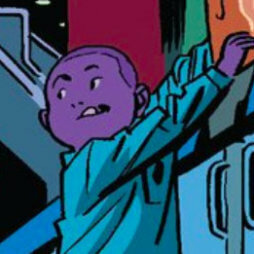 These were some of my favorites this issue. 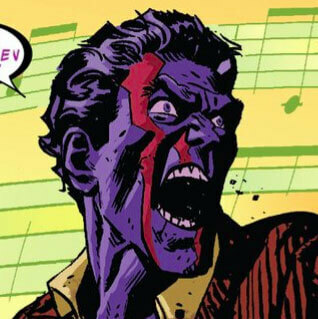 When put together they show the range that Samnee is capable of, from the Kirsten’s startled yet humorous expression to the pure insanity and range of the Purple Man, greatly highlighted by Matt Wilson’s contrasting purple and bright red. Matt looking down while disrobing made my list for the simple reason that it’s a great example of a less extreme expression, as well as being a great shot of someone being in the middle of an action or movement. It’s a great way to inject extra life into a quieter scene. I really like images of hands. Hands are great at communicating action, or inaction, as we’ve already seen above. 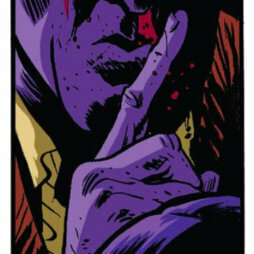 So maybe, after reading that powerful final page, I couldn’t help seeing hands everywhere this issue when I went back to read it again. There is also the fact that reaching out, as seen in the first example below, and a failure to reach back is a common thematic thread, which puts even more focus on where people’s hands are. 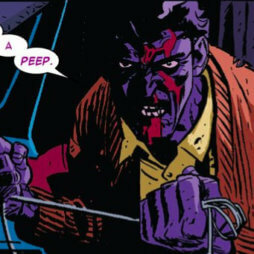 We have everything from Daredevil’s immobile clenched fist to Purple Man’s murderous paws. Either way, they all look great! So, did I miss anything? Let the rest of us know in the comments! Aside from the “Born Again” connection, the description of depression also reminded me of Miller’s script for #177 of Vol. 1, “Where Angels Fear To Tread,” when Stick helps Matt regain the use of his radar sense by facing his innermost fears. Gorgeous caps and very interesting things that you pointed out. I enjoy this issue more and more each time I see it. 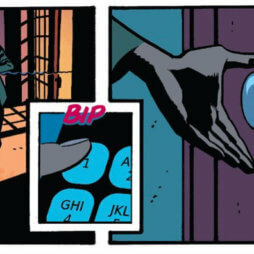 I just wanted to point out the visually interesting way Samnee choses to convey the way Matt identifies people through smell. 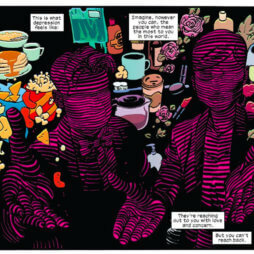 I liked that the radar silhouette figures of Foggy and Kirsten are surrounded by items of food that they eat, drinks they like, perfume and makeup that they wear etc. 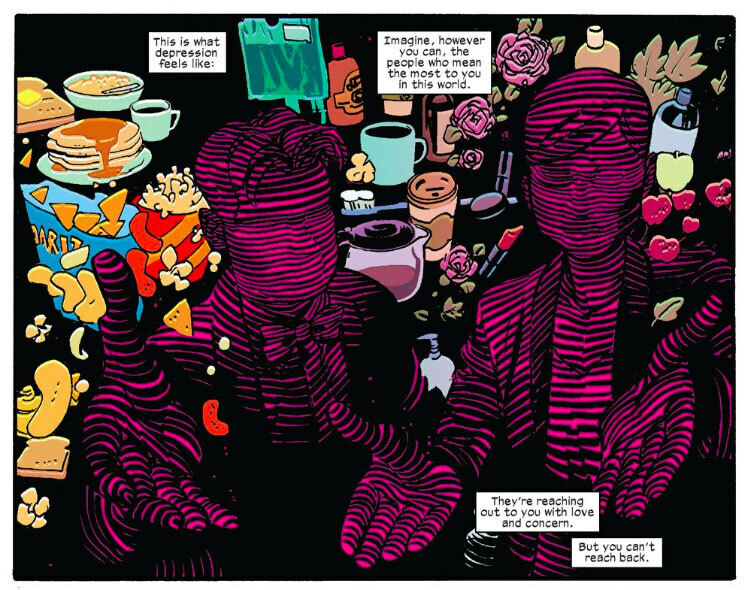 It clearly shows not only how Matt identifies them through the way they smell, but also conveys those characters personalities, interests, and how Matt ‘sees’ them. 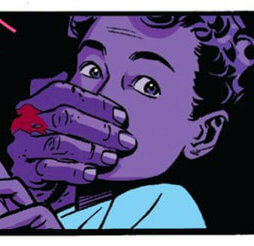 All done in one panel with essentially no words. And the hands reaching out also help push forward the overall themes of depression. 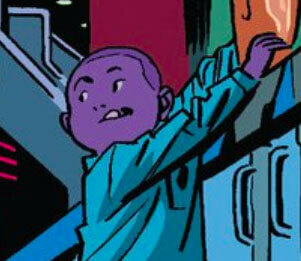 Just a masterful little panel. Also just wanted to point out a question that I had about the last page. It was a beautiful page and I think it was done the way it was to convey the emotion and surprise that Matt had to find out Kirsten was still there waiting to help him, but how did Matt not know she was outside his bedroom the whole time? Surely he would have heard and smelled her out there.